Sure the dealership will do it, probably for a couple hours labour, but where's the fun in that? When automakers want to lure you to higher and fancier trim levels, they add all sorts of fancy features. Usually some you want and some you don’t care about. Like if you want leather seats you might also have to take the sunroof. Or if you want the good stereo you need to take all of the active safety features. They’re hoping you want the feature badly enough that you’re willing to pay for all the extra stuff you don’t. But there’s a way around it. To get some of the features you wanted without the ones you didn’t. 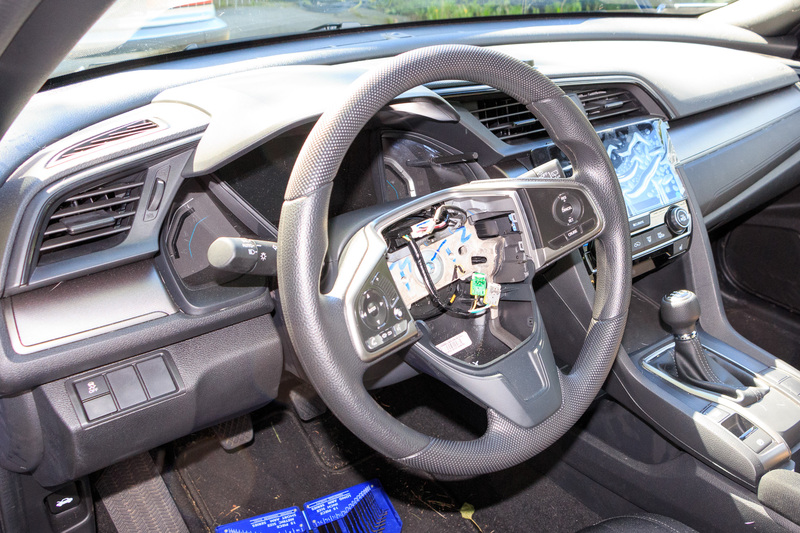 It won’t work for every feature – adding some electronic bits is just a bit too far – but with a little time, effort, and money, you can still customize your own car. Using genuine parts straight from the manufacturer. 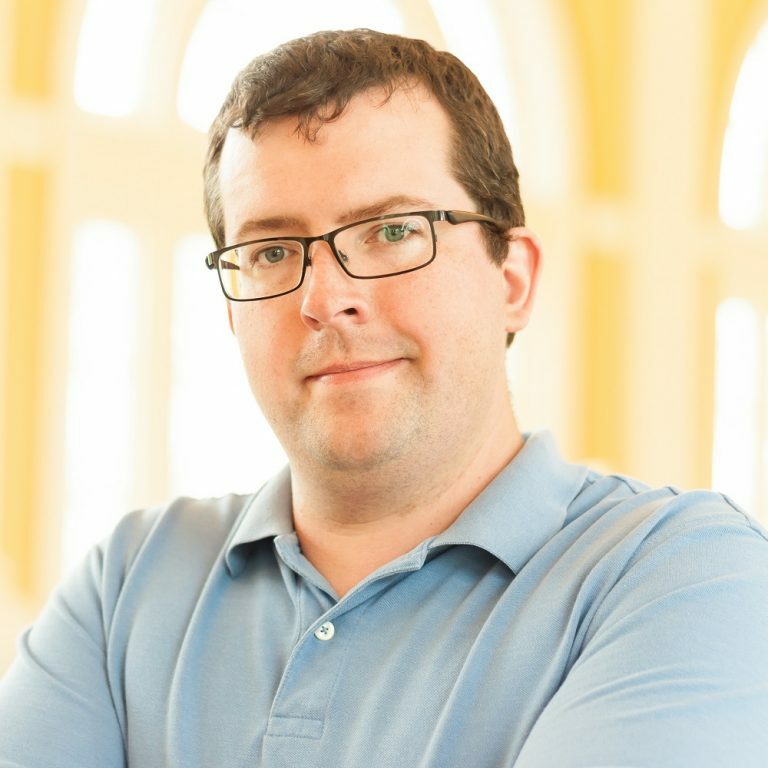 Depending on what you’re looking for, it could range from surprisingly cheap to enough that maybe you’ll just take the extra features. My first modification covers one that’s about as cheap as it gets. 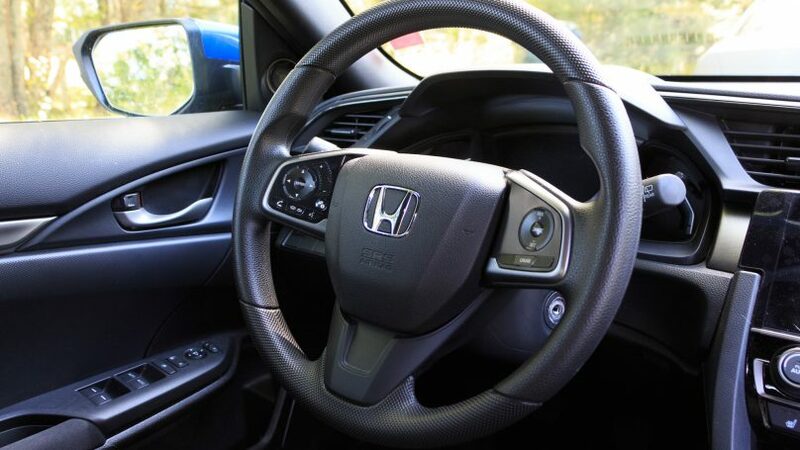 If you want a leather steering wheel in your Civic hatchback, Honda assumes you’re also going to want proximity locking, dual-zone climate, 18-alloys, and a whole bunch of other stuff. That’s pretty common to most automakers, so we’re not picking on just one here. I wanted the wheel, but I didn’t want all that other stuff. I enjoy buying cheaper 16-inch tires and the better ride that comes with them. I also didn’t want to spend about $5,000 to get a nicer steering wheel. Luckily for buyers, cars are designed to be as similar as possible across the line. 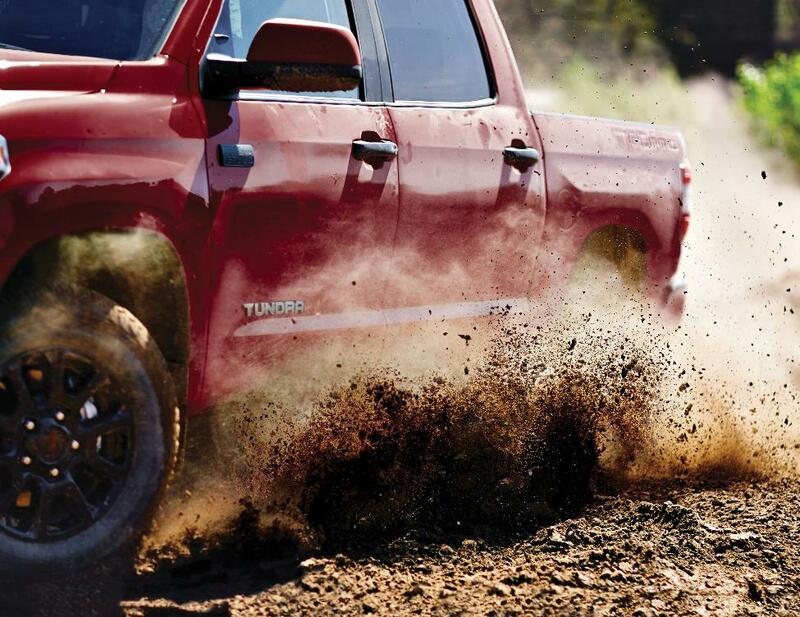 Like if you didn’t opt for the fog lights, there’s a good chance the wiring is still there. One wiring harness is cheaper than a dozen different ones. Sometimes you can just plug and play. 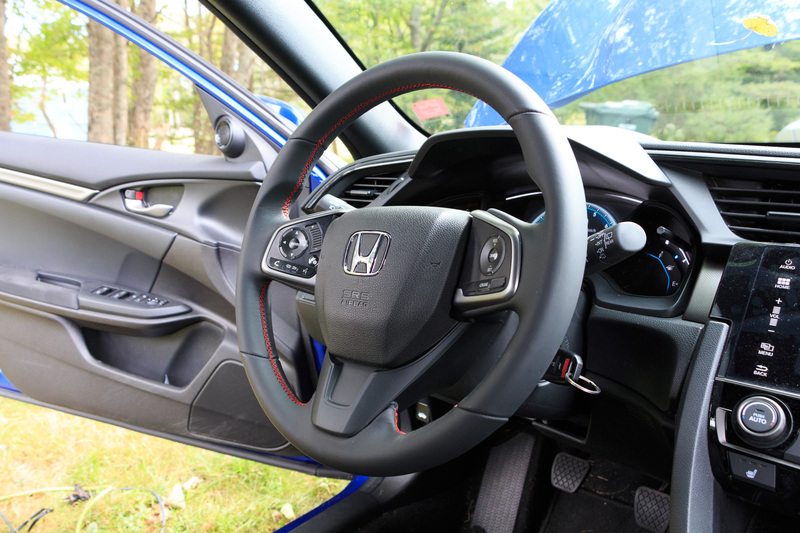 So every new Civic uses the same steering wheel. More or less. The differences are in the trim, how many buttons it has, and how it’s wrapped. I wanted a leather-wrapped wheel. The stock plastic piece was acceptable, but it’s a little too rough and too plastic-feeling for my tastes. Aftermarket wraps are available, but they’re difficult to attach and don’t always fit well. So I went straight to the source. Honda offers multiple wheels for the Civic. 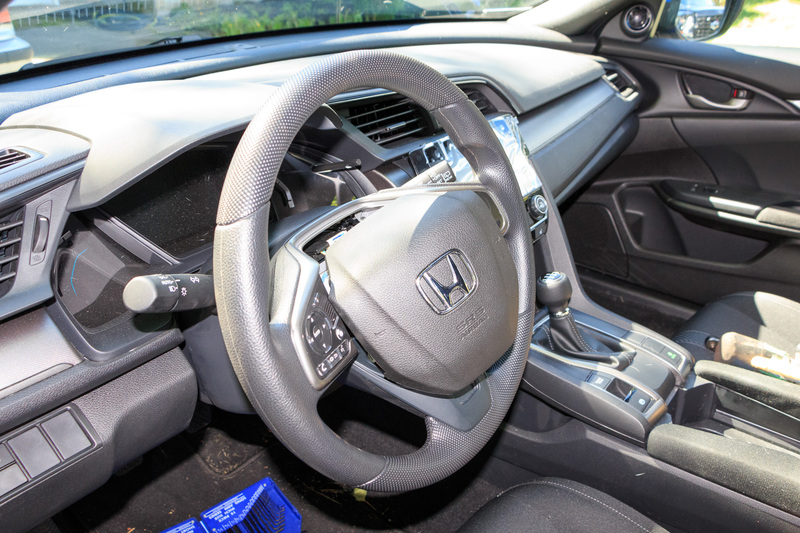 The EX gets leather, the Si gets leather with red stitching, and the Type R gets some fancy red trim. The R wheel is a popular option, but I wanted the more subtle Si piece. 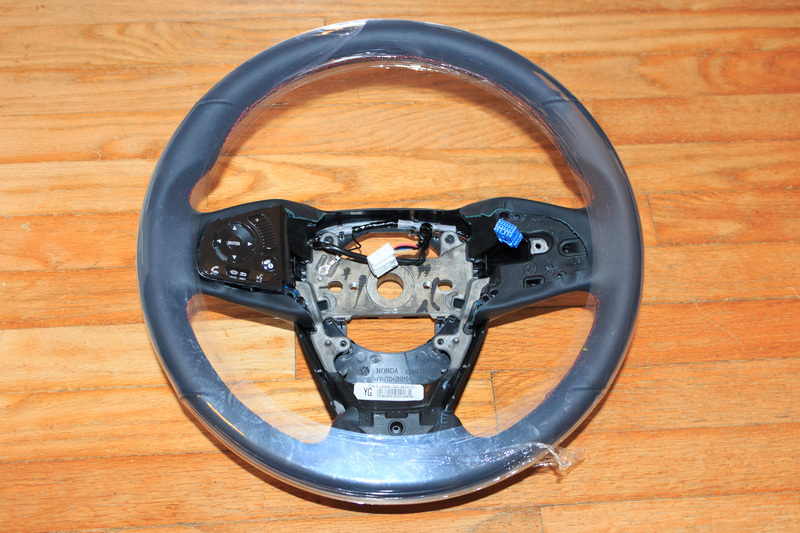 A call to my local dealer, a two-day wait, and well under $200 and I had the shell of a brand new Si steering wheel. All ready to improve my grip on the road. Now for the fun part. The install. Sure the dealership will do it, probably for a couple hours labour, but where’s the fun in that? It’s a simple job, as far as working on a car goes. Step one, of course, is to unhook the battery. An airbag in the face is not fun. Plus airbags are expensive. Two hex-head screws secure the airbag to the wheel, one on each side. Once that’s done the airbag falls forward. 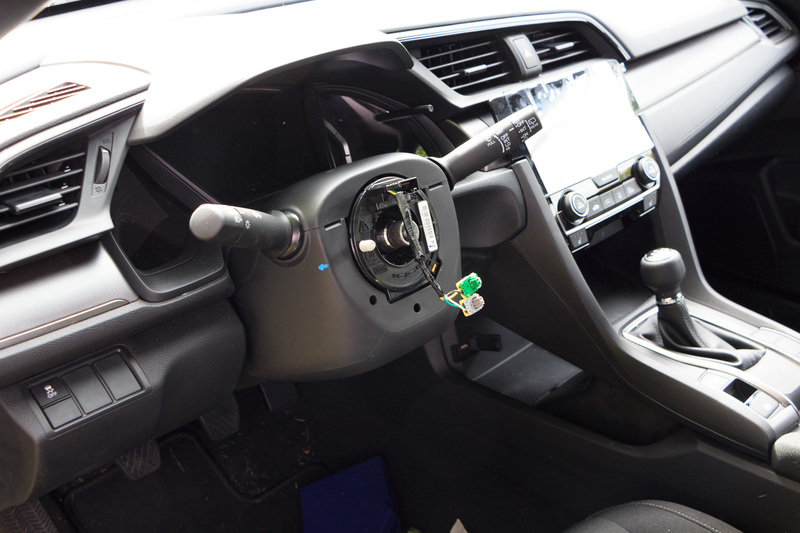 Pull two connectors and a ground wire and the airbag gets put to the side. The steering wheel bolt is the toughest part of this project. It’s not easy to remove. Which is a good thing because having the steering wheel come off on your drive would be a really bad time. It’s a big hex bolt in the Civic, but you’re not going to be able to use a hex key. A socket is required. The bolt here used green thread sealant that held on tenaciously. A few minutes of heat from a heat gun I borrowed from the bathroom (code for hairdryer) and my impact wrench was finally able to loosen the bolt. 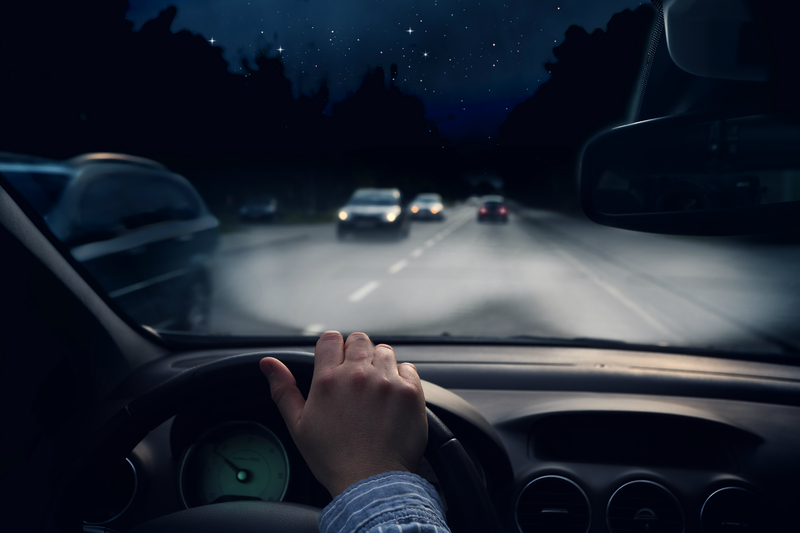 Don’t just leverage against the steering wheel lock, or you’ll break it. Good if you’re a car thief, bad if you’re a car owner. Make sure that you mark exactly how the wheel is oriented before you remove it. You’re not going to want to put it back on off-centre. 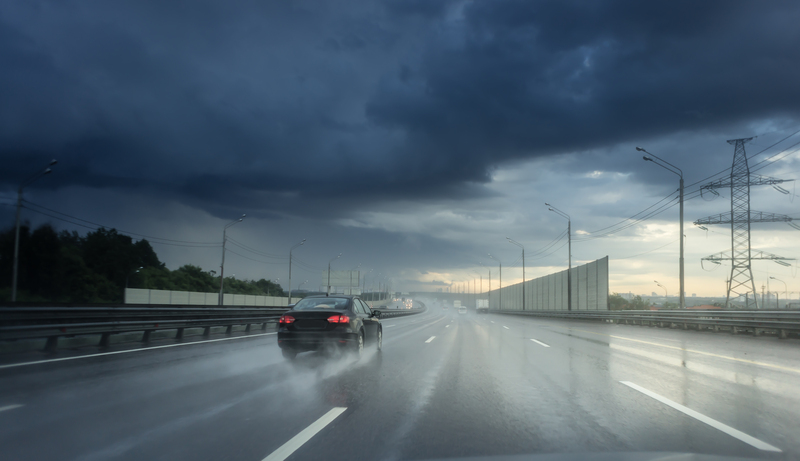 It’s annoying and can throw your active safety features like lane assist out of kilter. Then you need an expensive recalibration. I used a window marker and made a line across from the wheel to the column in multiple spots. Make sure you mark a trim piece, not the wheel itself, because the old wheel isn’t going back on. There were a few pieces that needed to be transferred from old wheel to new. Like the audio and cruise control switches. This will differ from car to car, so if you’re not sure how to remove the trim then you might not want to do this part yourself. Check for online forum tutorials or see if your local library has repair manuals online. Just be careful when you’re prying off trim pieces. 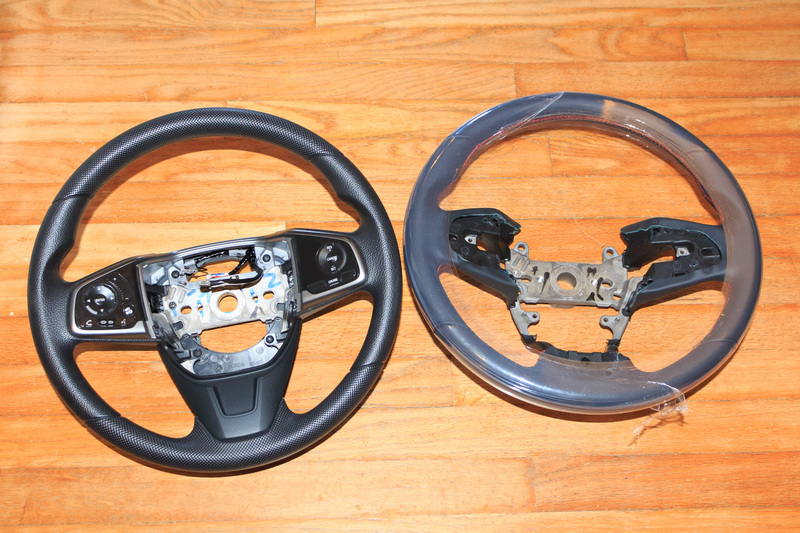 I removed the trim from the old wheel as well as the buttons, securing them to the new wheel. Assembly, as they say, is the reverse of disassembly. Make sure all the connectors and grounds are attached, make extra sure that centre bolt is retorqued properly, and then reattach the battery. Thanks to Honda for having an infotainment system that remembers what your radio presets were. With the battery connected and the dash clear of warning lights, it was time for a test drive. The new wheel feels massively nicer than the old one. It’s thicker, softer, and smoother. As far as car upgrades go, this might be one of the best bang for your buck changes around. To complete the look I could have added a big red H, or the Si’s silver trim, but I was happy with the rest of the look. My upgrade was just for better feel, but if you’re lucky you might be able to get a heated wheel out of the upgrade. And that one’s worth it almost no matter the cost. Next up? Maybe some leather seats. Or an audio upgrade with navigation. Or maybe just those fog lights. Nah, this time it’s suspension upgrades. All available straight from your dealer. If you know the right part numbers. Forums and part catalogues can be your friend.